The Seminoles' center played through torn labrums in both hips not because it didn't hurt (it really, really did) but because he had to. Now he and the other starters on Florida State's O-line hope to stay upright this fall and keep QB Deondre Francois clean in the process. Plus, old-school steakhouse quality meat at a quarter of the regular price. TALLAHASSEE, Fla. — Florida State center Alec Eberle isn’t exactly sure when he tore the labrum in his right hip. The junior from Mechanicsville, Va., knows it happened during a summer workout in 2016, but he wasn’t positive something was amiss until preseason camp. Eberle knows exactly when he tore the labrum in his left hip, though. Facing second-and-10 in the second quarter at Syracuse on Nov. 19, Eberle snapped the ball to quarterback Deondre Francois. Syracuse defensive tackle Kendall Coleman bull rushed. To stop a bull rush, an offensive lineman must anchor, planting his back foot and driving his hips forward to stop the momentum of the charging defender. So Eberle planted his left foot—just as he had thousands of times before. “I felt my hip just give out,” Eberle says. Coleman lifted Eberle and drove him back toward Francois. Eberle remembers “getting dumped,” but he didn’t. He wound up on his feet seven yards behind the line of scrimmage. To avoid the Coleman-Eberle mass racing toward him, Francois had stepped up in the pocket and directly into a sack. Video from the game shows Eberle walking gingerly back to the line of scrimmage, but he didn’t tap his helmet and ask to come out. He didn’t even look at the sideline. He crouched back over the ball—hampered by two labral tears—and kept on playing. After the Seminoles beat Michigan in the Orange Bowl, Eberle and the Seminoles’ medical staff worked to fix the root problem. The labral tears happened because Eberle’s hip bones were too thick. The hip, like the shoulder, is a ball-and-socket joint. The round femoral head (the tip of the femur) is supposed to roll inside the hip bone to produce a full range of motion. The thickness of Eberle’s bones didn’t allow the femoral head to roll properly. “The trainers would try to stretch me out,” he says, “and my leg would just stop.” This created pressure on the labrum, the cartilage that rings the socket. If he kept playing, he was destined to tear them. And he did. So on Feb. 6, Eberle had surgery in New York to correct the issues. He says doctors told him most people have surgery on one hip at a time, but given his pain tolerance during the season, Eberle was a candidate to have both fixed at the same time. He stayed in the hospital on the night of the surgery. The following night he stayed at his sister’s house. His mother was in another room, ready to help if he needed anything. That night, Eberle’s pain medicine wore off. He could only scoot a few centimeters at a time, and he couldn’t figure out how to get his mother’s attention. She assumed he was asleep, so she was trying to let him rest. So he laid in bed and suffered for six hours. Eberle thought back to all those times it felt like someone stabbed in his hips. This felt like someone taking an ax to them. So he told himself the same thing that got him through the season. That night, Eberle wrote a note to himself in his phone. The result looked like an E.E. Cummings poem—if E.E. Cummings played offensive line and felt like his hips were about to explode. Eberle found the note in his phone about two months ago. He’d forgotten he’d written it, but the reminder motivated him even more to get himself ready for this season. After the surgery, he wasn’t supposed to walk for a month. He walked in a week. “They said that was weird,” Eberle says. When he began squatting again in May, he started with the naked 45-pound bar. Within two weeks, he could squat 350 pounds. Since then, his numbers are better than they ever were before the injury. When he began doing football drills again, he realized he could open his hips without turning his torso. It took some time to get accustomed to what everyone else considers normal. “The best way I can explain it is like a newborn horse or a deer” learning how to walk, Eberle says. The 6' 4" Eberle will play this season at about 305 pounds. Last year, unable to do the lifts required for weight maintenance, Eberle dropped to 285. This week’s topic is reader-generated—as all the best ones are. You can have one fictional meal or food item from any show/movie, which one do you eat? Instead of one, here are 10. 1. Florida has suspended seven players, including top receiver Antonio Callaway, for the season-opener against Michigan. The reported reason involves making improper charges using a student ID. (Students can load money onto the cards and then use them like a bank debit card on campus.) As of this point, there have been no charges filed, so we may never see any kind of police report that details specifically what happened. Absent that information, it’s difficult to tell if the one-game punishment is appropriate or too lenient. We do know that Florida will be without its most dynamic receiver against the Wolverines, but unlike the previous two years, the Gators may have the depth at that position to handle Callaway’s absence. Sophomore Tyrie Cleveland came on at the end of last season. Junior Dre Massey was supposed to play a huge role in the Gators’ offense last year and tore his ACL on the opening kickoff. He’s back. Freshman James Robinson just arrived on campus, but he could be pushed into action sooner. The real question remains who will throw to those receivers. Contrary to popular belief, Notre Dame graduate transfer Malik Zaire wasn’t handed the job immediately. He is competing at practices against redshirt freshman Feleipe Franks and senior Luke Del Rio, and there is no favorite at the moment. It should be noted that the Gators had Callaway when they played Florida State and Alabama the past two seasons, and they still couldn’t move the ball effectively. For Florida, it still will come down to whether the Gators can get better quarterback play. 2. Notre Dame and Wisconsin are holding a big scheduling announcement that will include officials from the Chicago Bears and the Green Bay Packers. Sorry, home-and-home fans. At least these games will be played in two of the least sterile NFL stadiums. Big news regarding our future schedule tomorrow. 3. You’ve seen plenty of clips of players toting huge weight in this space. But the guys designing the workouts can still get after it, too. Here’s Clemson strength coach Joey Batson, who has been a college strength coach for 32 years, deadlifting 500 pounds. Director of Strength & Conditioning @CoachBatson putting 500 on em. It stinks for Wisconsin linebacker Jack Cichy, who will miss his senior season because of a torn ACL suffered last week in practice. Cichy worked all offseason to come back from the torn pectoral muscle that cut last season short only to see this season end before it began. The woman at the table to my right looked at the canoe-shaped object that had just arrived at my table. Then she looked at her friend. Then she looked at me. I never expected to hear that sentence in my life, but I also had never had such an impressive display of charred bovine musculature arrayed before me on something that looked like a small personal water conveyance. Sure, I’ve eaten some delicious steaks. There’s the Fabulous Filet at Charley’s in Tampa in Orlando, a dry-aged, 20-ounce, center-cut masterpiece that can be sliced with a fork. There was this beautiful, rare 64-ounce tomahawk ribeye at Ruffino’s in Baton Rouge. All those previous steaks were limited by cut, though. Even the porterhouse only offers the filet and the strip. The Asado Platter at Pittsburgh’s Gaucho Parrilla Argentina does not force diners into a carnivorous Sophie’s choice. It comes with healthy portions of flank, sirloin, filet, ribeye and strip. It costs $50, and it can feed four normal-sized adults, two extraordinarily large adults or one me. When I ordered at the counter and gave my party size (solo), the cashier announced it to the staff because apparently this sort of order happens pretty rarely. He also announced that I didn’t plan to ask for a doggie bag. This drew a thumbs-up from the guy manning the grill, but that gentleman deserves all the praise. Because if eaten as intended—by multiple people alongside slices of charred toast dunked in chimichurri and beautiful wood-grilled vegetables—the Asado Platter beats the taste and the experience at all but the very best steakhouses for a fraction of the price. Let’s say you’re splitting it four ways, which will provide enough meat to make the average adult happy. That’s $12.50 a person. Add in sides split four ways and that’s another $10 a person. The place is BYOB—or BYOW—with no corkage fee, so bring two bottles of wine that run $20 at the store (between $80-$100 at a steakhouse) and split that cost four ways. Add a nice tip for the hardworking cooks and staff, and that comes out to a little less than $40 a person for a steak dinner that blows away meals that cost five times as much. The Asado Platter at Gaucho Parillo Argentino in Pittsburgh. The reason is the steak itself. Each cut is expertly seared and cooked precisely as ordered. I usually order my steak rare, but I wasn’t sure if I should do that in Pittsburgh because in steakhouse parlance the city’s name indicates an extreme form of rare just a shade up from tartare. But the rare I got matched the rare in any other city. The meat isn’t dry aged—which is why Gaucho Parrilla Argentina can charge less than a red velvet-walled steakhouse—but the filet still comes out impossibly tender. The marbling from the ribeye is just as hearty. 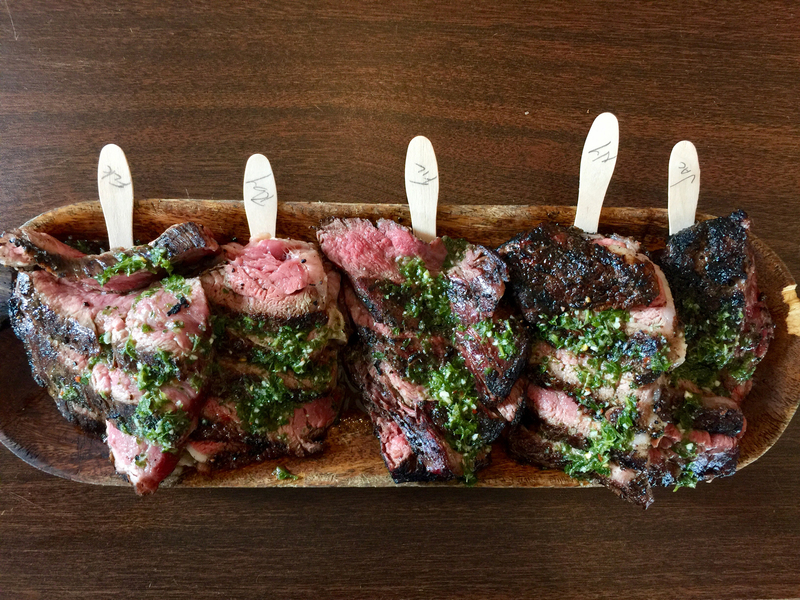 The flank still dips wonderfully into that house-made chimichurri. This way, everyone gets to try every cut without the awkwardness of slicing off pieces of each person’s entree. As an added bonus, someone might need to take a picture of your meat. And we can all use that kind of morale boost.